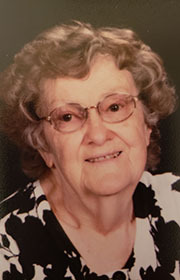 CALLENDER — Marilyn M. Peterson, 87, passed away Tuesday, July 24, 2018 at the Paula J. Baber Hos­pice Home in Fort Dodge. Funeral services will be 10:30 am Monday, July 30, 2018 at Our Saviour’s Lutheran Church, Callender with Pastor Greg Stano and Pastor Deb Stano officiating. Burial will be in Callender Cemetery. Friends may call from 4:00 to 7:00 pm Sunday, July 29, 2018, at Palmer Funeral Home, Gowrie. Marilyn is survived by her husband, Phillip Peterson of Callender; daughters, Sonja (Dann) Johnson of Thompson and Heidi (Tim) Parcel of Norwalk; son, T.J. (Dianne) Peterson of Callender; 6 grandchildren; 12 great-grandchildren; sisters, Joan Fors of Dayton and Judy Harklau of Humboldt; brother, Quentin Pearson of Gillette, WY; and step-brother, Marion Peterson of Callender. She was preceded in death by her parents, Arthur and Verna (Anderson) Pearson; infant daughters, Kristine and Nina; brothers, Vernon Pearson and Kermit Pearson; step-father, Martin Peterson. Marilyn M. Pearson was born March 19, 1931 in Murdock, MN. In 1945, the family moved to Iowa and she graduated from the Burnside High School in 1949. On April 29, 1951, Marilyn was united in marriage to Phillip Peterson at Our Saviour’s Lutheran Church in Callender. The couple established their home on a farm near Callender. Marilyn and Phillip farmed and operated a dairy farm for 50 plus years. Marilyn was a member of Our Saviour’s Lutheran Church in Callender.